Gerlind Cornell Borchers (16 March 1925 – 12 May 2014) was a German actress and singer, active in the late 1940s and 1950s. She is best remembered for her roles opposite Montgomery Clift in The Big Lift (1950) and Errol Flynn and Nat King Cole in Istanbul (1957). She was noted for her resemblance to Ingrid Bergman, though fairer in coloring. Borchers was born in Šilutė (German: Heydekrug), Klaipėda Region (German: Memelland), Lithuania in a German either Prussian Lithuanian or Memellander family. She appeared on the cover of East German magazine Neue Film Welt of 1949, Volume 3, Issue 4. She won a BAFTA Film Award in the category of Best Foreign Actress in 1955 for the movie The Divided Heart of 1954. She retired from acting to raise her child. 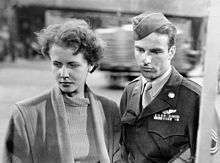 She was married twice, first to Bruce Cunningham and then to Dr. Anton Schelkopf, a psychologist, physician and film producer, whom she first met when she starred in his films Schule für Eheglück (1954) and Rot ist die Liebe (1957), by whom she had one daughter, Julia Schelkopf, born in Munich, on 15 September 1962. The couple divorced later. She afterwards lived in Bavaria, Germany and died there in 2014. ↑ Bowker (May 1989). Variety's Film Reviews: 1954-1958. Bowker. ISBN 978-0-8352-2787-2. ↑ "Cornell Borchers, German Star, Like Young Ingrid Bergman". The Milwaukee Sentinel. 30 March 1955. Retrieved 23 January 2016. 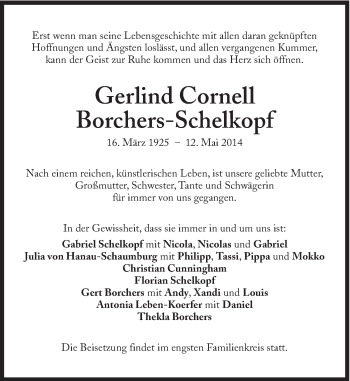 ↑ "Gerlind Cornell Borchers–Schelkopf". trauer.sueddeutsche.de.